Chettinad restaurant (Karaikudi) and buffet restaurant (Lotus World Buffet) on the corner of North End and Tamworth Road, near West Croydon Station. Although the two parts of the restaurant have different names, they're operated by the same people and there's no segregation of seating inside — whether you're ordering from the Chettinad menu or serving yourself from the buffet, you can sit anywhere. Lotus World Buffet was open by October 2015 (under different management than the previous buffet restaurant in these premises), and Karaikudi joined it a couple of months later, with the first day of operation being on Saturday 12 December. Karaikudi didn't have a printed menu as of our visit, but the options described to us included biryanis, dosas, chapati, puri, and various curries. As of late 2016, they no longer do dosas, but there is a counter at the front with different dishes to order (e.g. banana curry, lamb curry, fish curry, etc). It's fine to mix and match between this counter and the world buffet. It was previously a pub known as Arkwrights Wheel photo. As of June 2012, it was under the name Babylon Inn photo and the bar was still in place, with handpumps on it, but this was removed in a refurb during early August 2013 photo of sign. The refurb also divided off part of the building's area, which later opened as Babylon Centre. Another part was divided off to create Croydon Hairdresser in January 2015. It was never entirely clear whether the name of the restaurant was Babylon Inn or Babylon Buffet. The food choices included Indian, Chinese, Middle Eastern, Italian (including pizza), and burgers. They also did takeaway and delivery. Babylon Buffet was closed down in 2015 due to food hygiene violations. 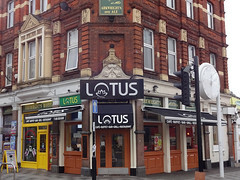 As of October 2015 the premises were under new management and using the name Lotus World Buffet; there was also a sign on the outside saying that a Chettinadu restaurant called Karaikudi would be opening there soon photo. The first day of operation of the Chettinad restaurant was Saturday 12 December 2015. Last edited 2019-01-08 16:06:07 (version 67; diff). List all versions. Page last edited 2019-01-08 16:06:07 (version 67).